Here is one of the simplest ways to make peppers and, to my mind, one of the most delicious: peperoni al gratin, or peppers au gratin. 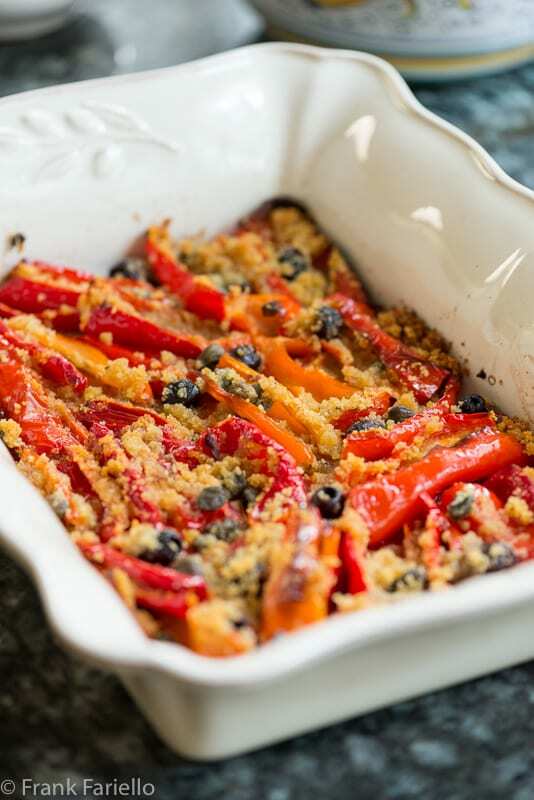 Oven roasting intensifies and sweetens the natural flavors of the peppers, while garlic, olives and capers add piquancy, and a topping of seasoned breadcrumbs savor and crunch. The dish is equally good as a side dish, especially with grilled or roasted meats, or as an antipasto. Toss the peppers with enough olive oil to coat them lightly. Lay the peppers in a baking dish, arranged in a neat pattern if you like. (NB: I prefer laying the strips skin-side down so the concave insides help to catch the flavorings and topping.) If you need to, you can arrange the peppers in two layers. Place the garlic, olives and capers here and there, nestling them among the peppers in an even distribution. Mix the breadcrumbs with the oregano, salt and peppers, then add just enough olive oil so that all the breadcrumbs are moistened, mixing well so that the breadcrumb mixture attains a sand-like texture. Sprinkle this mixture over the peppers evenly, so each pepper strip has at least a bit. Drizzle more olive oil generously over everything. Bake in a hot (200C/400F) oven for about 30-45 minutes, or until the peppers and tender and the breadcrumbs are a golden brown. The edges of the pepper strips may begin to char a bit—that just adds more flavor. The recipe works for just about any type of non-spicy capiscum, but frying peppers like the ones pictured below may be the best choice. Their thin, tender skins means they don’t need peeling, and they have very little in the way of seeds and ribbing inside, so they need minimal trimming as well. If you use good old bell peppers, you may be better off peeling them. See this post for instructions on the easiest method of trimming and slicing them. Although a bit more work, you may even want to pre-roast your peppers beforehand, for which see this post. Not only does pre-roasting the peppers make them easy to peel, roasting lends an intriguing sweetness and smokiness to the dish. As for the olives, again just about any kind will do, although personally I like to use small black olives of the Gaeta or niçoise variety, pitted, however untraditional that might be. The capers can be salted or brined. Although I’d venture to say that most caper connoisseurs will tell you that salted capers have a finer flavor and texture—and I agree—for this particular dish I don’t think it matters too much. In either case, however, rinse the capers well and then squeeze them dry before you add them to the dish. Recipes for peperoni al gratin are surprisingly uniform, but the measurements vary greatly, which tells you that precise measurements, as is so often the case, don’t matter all that much. The amount of breadcrumbs, in particular, varies tremendously. Jeanne Caròla Francesconi calls for a very light topping, only two tablespoons of breadcrumbs for 2.5 kilos of peppers! In other recipes, the breadcrumb topping literally buries the peppers. I like this middle ground, where the breadcrumbs cover the peppers only partially but are an important element of the dish, adding significant crunch as well as flavor. For extra savor, some recipes call for some grated cheese, sometimes Parmesan, sometimes pecorino. Personally, I’d call that gilding the lily. On the other hand, anchovy fillets might be nice in addition the traditional olives, capers and garlic. This dish is just as nice served hot, warm or cold (not literally cold, but rather room temperature). Personally, I find that peperoni al gratin are at their best slightly warm but not hot. The dish can successfully be reheated in the oven. And leftovers make a fine condimento for pasta, in particular penne. Trim and slice the peppers into strips. Toss the peppers with enough olive oil to coat them lightly. Lay the peppers in a baking dish, arranged in a neat pattern if you like. Hi Frank…you already know from FB that I made these last night but I did want to post a comment here too! I used end of season red bell peppers because our local guy had none of the others available and you know what, the dish was fantastic…absolutely delicious! Used as a side with barbecued pork chops…will definitely be making them next summer with the long red peppers!!! That’s great, Phyllis. So glad you like them. ? Seriously, why have I never seen or had these before? OMG, I would LOVE these! I have to remember to make them next time I get good peppers! Thanks, Frank! And thank you, Christina. I have to say, you have been missing out. So simple, but so good. Definitely worth a try! I have a variety of peppers still happy in the garden. Definitely will be doing this. Loving the additions of olives and capers. Enjoy, Claudia! This’ll be especially nice with peppers from the garden. Why have I never done this? I shall prepare it this weekend as a side dish for our pizza party. Hope you enjoy it, Paula! What a wonderful dish – and new to me! Such a simple, wonderful Mediterranean dish! With some fresh crusty bread, it would also work as a main for us, especially during the summer when one needs less food with the heat and all, right? We can totally see ourselves having this as a light dinner. Thanx so much for another awesome recipe Frank! You’re welcome, guys! And you’re right: It would also work as a main for me, too, on a balmy summer evening. excellent and easy dish. 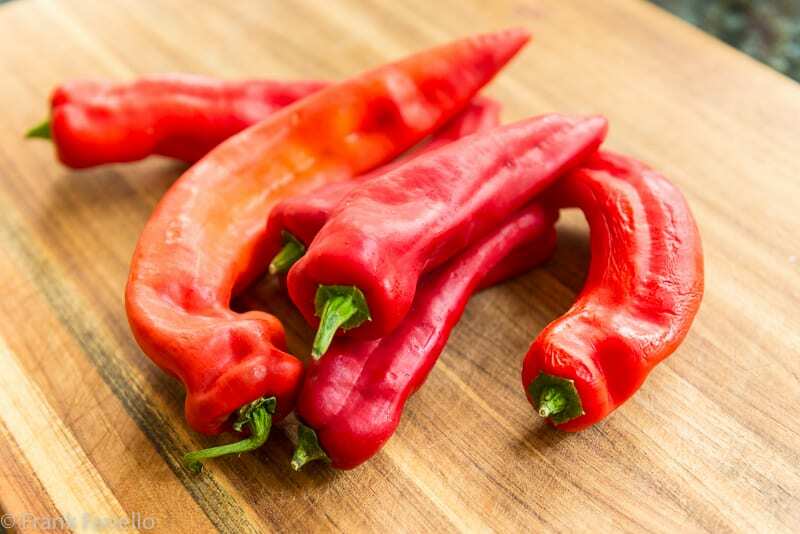 on roasting peppers: at home, I roast them on the flames of my cooker, using a net – I like the smoky flavor. at the restaurant, when we made trays and trays: we would roast them under the grill on the oven: quartered and tidied up peppers, lightly oiled, onto foil-lined trays + grilling them, with eagle eye. Peppers and potatoes sounds really nice. Will have to try that. If I pre-roast the bell peppers, then how long would you heat them in the oven with the olives, capers and breadcrumbs? Always such interesting recipes! My Mom used to roast peppers on top of the stove burners with charred bits flying everywhere! I roast my bell peppers inside a hot oven and then place them in a covered Corningware dish until cool enough to peel off their skins. I think of my Mom every time I roast peppers and think how less of a mess it is! Best is the aroma of the roasting peppers! I love the aroma of roasting peppers, too. 🙂 And I’ve also moved away from stove top roasting, too for the same reason. When I can, on the grill outside, otherwise in the oven. Anyway, in terms of cooking times, I wouldn’t reduce it too much, probably on the low end of the range given here or perhaps a few minutes less, to allow the breadcrumbs to brown a bit. What is simple and beautiful contorno! I’m hoping to find some good peppers at the market tomorrow – this will go so wonderfully with our pollo al mattone tomorrow evening! Thanks, David. Sounds like a great meal… 😉 Hope you enjoy them both. What a great way to prepare peppers. I can buy small peppers ( like you show in the photo) at our farmer’s market. I can’t wait to try this recipe. Thanks! Grazie, Chiara. Buona domenica anche a te! I’d probably roast the peppers — simply because I love their flavor. Really nice dish — love the combo of olives and capers. Thanks! Roasted peppers do have great flavor. Thanks for the comment, John! This is fantastic! So much better than just sautéed peppers. Wonderful and unique side dish. Thanks, Mimi! I do like fried peppers, but these make for a nice change. Frank – I have enjoyed this recipe, or something similar to it, many times in Italy. It seems to be a standard at antipasti offerings. One of my Italian friends makes them with a pepper that’s more similar to a bell pepper, but smaller and it’s delicious with those too. I have got to try this with the peppers still producing in my garden. I remember this dish well, too, from my Rome days. Funny it’s taken me 12 years to get around to blogging about it! Looks absolutely delicious … what a shame I’d just made all my peppers into sauce before I read this! Next time ….